Various washers manufactured by Brewster Washers, Fairfield, N.J. 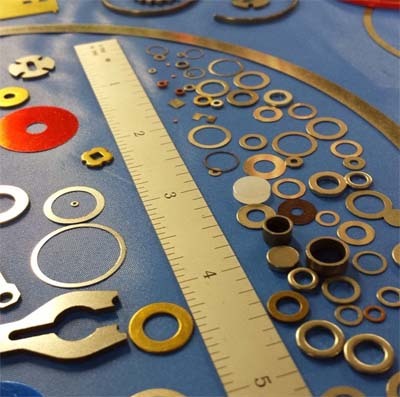 The company uses numerous materials– including copper, brass, aluminum, cold rolled steel, phosphor bronze, stainless steel, and non-metallic materials– to make the washers. Photo courtesy of Brewster Washers. 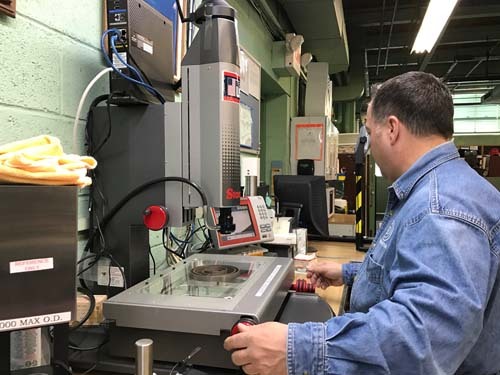 Brewster Washers has been turning out precision washers, discs, and shims for nearly 100 years in central New Jersey, where 'Made in America' was never in doubt. When Salvatore Freda Jr., touts the benefits of "Made in the USA," he's speaking from a New Jersey manufacturing plant with 98 years of experience in making parts for the defense, aerospace, and commercial industries. "Made in America gives you that good feeling, being an American and supporting other Americans who are working just as hard as you to support their families and support their employees," said Freda, president of Brewster Washers, a Fairfield, New Jersey-based manufacturer of precision washers, discs, and shims, in an interview. "It's almost an unwritten guarantee. Because it's made in America, you have a quality product." Brewster Washers makes parts for OEMs that have used them in everything from guidance systems to the Space Shuttle and the Mars Rover. The company stamps the parts using sheet material according to the customer's blueprint. "Our biggest strength and the reason why we have been in business for 98 years is that our quality and on-time delivery is paramount to our success," Freda said. "We take pride in having zero defects and 100 percent on-time delivery." For Freda, the quality that comes with Made in the USA is evident throughout a national web of manufacturers and suppliers. "It's what we do for our customers. It's what our suppliers do for us," he told D2P. "I try to use as many local vendors as I can, for obvious reasons. I'm saving on freight. I had to order tool steel and, luckily, four blocks away, a new tool steel place opened up– American-made materials." Freda said he ordered an 80-pound steel bar from the new tool steel firm on a Monday, and the owner delivered it to Brewster Washers' side door on Thursday, weeks ahead of schedule. If Brewster's shipping costs fall because its materials are Made in America, its OEM customer pays less for quality products. "We couldn't have asked for anything better," Freda said. "I had plenty of time built into it." 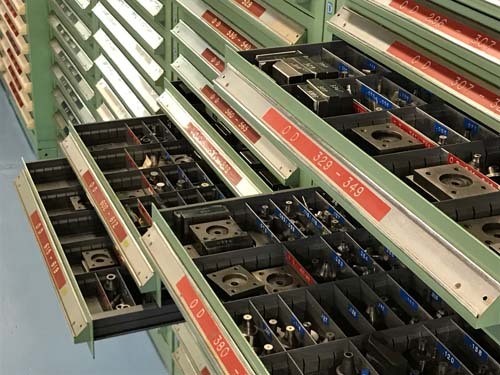 These drawers hold outer dimension inserts for die sets organized for easy retrieval depending on a customer's order. Other drawers around the factory hold other die components. Photo by Mark Langlois. In addition to relying on a web of local suppliers, another way Brewster lowers costs and speeds delivery is by searching its 250,000 dies to avoid making new ones, when possible. The company doesn't charge customers for making dies, and a benefit of that policy is that if a customer needs a certain-sized washer that Brewster made previously, Brewster reuses that die to make the new washer. There is no die cost. The die is ready and waiting. The work area inside Brewster's Fairfield factory is ringed with dies and die inserts labeled to help workers find the needed die and die insert. Workers on Brewster's staff tune up the dies to make sure they're precise. "We never charge for die creation. We use them interchangeably with other customers, which is usually a win-win for our customers," Freda said. "It's a cost-effective way we've always done business. Our customers appreciate that. They might think, 'Oh, it's the first time order, so if you don't charge me the first time, you'll charge me the next time.' We don't. It's been over 98 years and we've never charged for a die." How does this play with a new OEM? "I say, 'If you send me a sample of your part, I'll run a prototype and not charge for the die creation,'" Freda said. Brewster strives to make deliveries weeks ahead of schedule, unless months ahead is possible. 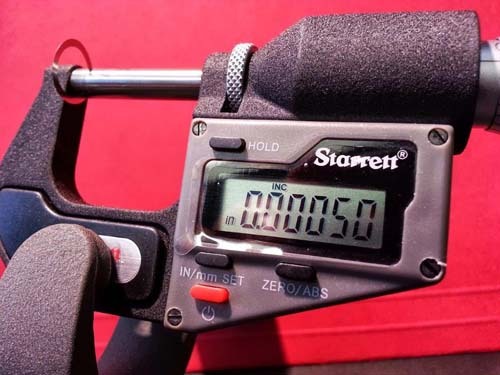 A Starrett micrometer is used to measure a sheet of stainless steel, which, at 0.0005 inch thick, is thinner than paper. Brewster Washers uses the sheet to make a thin washer to precisely level missile guidance systems. The washer is in the upper left corner of the photo. Photo courtesy of Brewster Washers. "Our goal is good pricing, outstanding quality, and delivery times when the customer needs it– going above and beyond," Freda said. "If they need a two-week delivery, we have it done in a week and ship it. If a customer gives us an order that's three months out, we'll get it on schedule within the first month and have it ready just in case they do expedite it." Made in America also means having the ability to turn on a dime for customers, Freda said. Brewster Washers received an emergency call on a Wednesday afternoon, at about 3:15 p.m., from a California-based electric car manufacturer. The customer needed 5,000 washers by Friday morning– parts that were specified to be 100 percent copper, with precision dimensional tolerances, no burrs, and guaranteed Friday morning delivery. Freda found the material with the correct dimensions in the warehouse. "We had a job already set up on that machine, so we took it down to meet the rush job schedule," he said. "We modified, to fit, one of our 250,000 dies that we have on hand. We printed them Thursday morning and shipped them out immediately, next day rush. They arrived on time." Freda explained that OEMs have ordered a part saying that they need it in three months, only to call suddenly and say they need it the day after tomorrow. Nobody apologizes for the schedule change. The part has to be there or a production line shuts down. "It's being able to act when they call on you," Freda said. "You get the call, you're ready. You go. This past weekend, we had an issue with a customer who placed an order in December. We got to the order in mid-January. They called us Friday and they needed it Monday. The part was at the plater and they were going to ship it Monday. We had them overnight it to us Friday. It was here by 9 a.m. Saturday morning. We came in, inspected the parts, packed them, and shipped them. It arrived at the customer at 9 a.m. Monday." The part was an aerospace shim, 0.002 inch thick. It was made from 302 stainless steel, full hard. Brewster Washers shipped 3,000 shims, packed with air in the bags to avoid damage during shipping. "That's what we'll do for a customer, or we'll get our suppliers to go the extra mile for us," said Freda, who grew up at the firm where his father worked. "A washer is a washer. There is nothing that can set you apart except your quality, your service, your undeniable record, and past history of delivering parts and orders without rejections." Brewster Washers President Sal Freda, Jr., demonstrates a measuring device used in the plant to measure the precision of a company's part. The metrology department appears to have six measuring devices ready for use, as well as historic hand-held micrometers. Photo by Mark Langlois. Brewster Washers was founded by William H. Brewster Jr,, as Wm. H. Brewster Jr., Inc., in Newark, New Jersey in 1919. Brewster, an accomplished tool and die maker, manufactured tools, dies, and metal stampings for metal working firms, the company said on its website. Brewster passed his skills on to employees until his death in 1958. The company moved to Fairfield from Newark after the founder's death. William Brewster's daughters, Katherine and Marguerite Brewster, ran the company until Marguerite's passing in 2000 and Katherine's in 2010. Leadership in the firm then passed to Salvatore Freda, Sr., a company team member since 1952. Salvatore Sr., did not encourage his son, Salvatore Jr., to join the firm. He wasn't sure the company had a future. "I've known the Brewster family my whole life," said Salvatore Freda Jr., who joined the firm in 1997. "In one word, I'd say Brewster Washers is family. We treat each other like family. We try to leave our personal lives at home, of course, but that doesn't mean that somedays we're not babysitting somebody's child." Sal Freda Jr. modernized the firm by adding a company website and email, by updating the old roll fax machine, and by deciding to fix the giant "no-quote" pile of paperwork. One of the modernization steps was adding "DBA Brewster Washers" to the official company name. Freda explained that in 1919, calling the company Wm. H. Brewster Jr., Inc., made sense. But in 2017, a person hunting the internet for washers uses the word "washers" in the search, and a company better have "washers" in its name to get the business. Freda added the new name, Brewster Washers, on the outside of the building. "We received four jobs right off the bat because people in the neighborhood said, 'I never knew what you made,' Freda recalled. Freda said the changes he made to Brewster Washers in 1997 are the same kind any new person coming into an old manufacturing plant would make. "The no-quote pile was four or five times higher than the quoting pile they were doing. Again, they were just quoting by fax. They were communicating by fax so the communication lag really hurt them," Freda said. "The email was a no brainer. Some of the quotes they were no-quoting were potential business they were just throwing away." He said that sometimes, new eyes and a new perspective are all a company needs. He said the "no bid" pile essentially disappeared since he arrived 19 years ago. In some cases, workers wouldn't bid parts that appeared too complicated, or they were something Brewster never made before. "They were complacent," Freda said. Today, Brewster quotes virtually everything. The company stamps washers, shims, discs, and spacers from aluminum, copper, brass, phosphor bronze, stainless steel, and other metals, using dies made in its Fairfield, New Jersey plant. It uses EDM machines to make more complicated shapes. The company also makes non-metal items from a wide range of materials. Its parts go into aircraft, defense vehicles, cars, cameras, computers, motors, dental equipment, motion controls, robotics, and valves, among many other uses. Freda said one of the company's strengths is its skilled employees, who, as William Brewster did, pass their skills on to newcomers. Lou Garisto, a tool and die maker, has been with Brewster Washers for over 40 years. The one thing that changed the most during that time, he said, is what the customer demands. "Accuracy," Garisto said. "Our customers want tighter tolerances that ever before. Customers weren't looking for the tolerances they are today." Garisto said that he stuck with tool and die making because he enjoys this trend. "I like to do better and better. I take pride in getting it done right," he said. "Our parts are very important, they tell me." Garisto was struggling with a damaged die insert recently and talked it over with company president Freda, who looked at the insert and shook his head. "Looks like a problem with the theory of relativity," Freda said, and Garisto nodded in agreement. The die insert punches a metal washer and this insert split during the job. Garisto explained that the insert surface– in this case, in the shape of a typical round washer– was thinner at the insert rim than the metal it was punching. The insert rim was 0.0215 inch wide, but the material was 0.035 inch thick. "The rim thickness cannot be thinner than the material," Freda said. "We call that the theory of relativity around here." To continue that job, Brewster Washers set about carving a new die insert from tool bar stock. Freda said he knows a few tricks about designing. Among other uses, Brewster Washers manufactures washers that serve as shims to level missile guidance systems. Paper thin doesn't do the thin shims justice. They might be one-eighth the thickness of a sheet of paper. That thin a washer can't be punched by a die all by itself. Brewster will run a thicker piece of metal alongside it, and that tandem punch helps Brewster manufacture such thin washers. One recent challenge Garisto faced was a washer that was ordered at a thickness of 0.025 inch. Brewster Washers ordered the material at that thickness and had no problems making washers with the precise inner diameter and outer diameter. A problem arose from the thickness. The supplier's thickness ran like a wave through the metal, thicker and thinner than required. The same washer might be 0.023 inch thick on one edge and 0.028 inch thick on the other edge. When Garisto presented Freda with this issue, Freda decided the order was so small, workers could run 1,000 pieces and measure each one to check the outcome. Brewster has a metrology department set up to measure multiple dimensions on washers. Discard the washers outside the proper measurements and keep the rest, Freda said. "We have several employees who have been with us for so long that they help teach the 'newbies' the skills that you can't find in books or through seminars. Die making is a dying art, and our tool and die maker has passed down the art to the newer employees," Freda said. "We need the hands-on skills. We're always learning from him and enhancing his old techniques." Brewster Washers meets federal DFARS regulations as a parts supplier to defense contractors. The regulation says the metal must come from the U.S., or approved sources outside the country, typically from our allies. Brewster Washers is ISO 9001:2008 compliant and it is DTCC registered as a certified defense supplier by the U.S. State Department. It is working on ISO 9001: 2015 certification, and management systems already earned ISO 9001: 2015 certification. "I had somebody call me and say, 'These stainless steel washers are rusting on me,' and my first question to him was, 'Where did you buy them?'" Freda said. He knew they weren't from Brewster Washers. They came from overseas, it turned out. "So they're telling you one thing. They're selling you another," Freda recalls. "One advantage to buying American is companies can do this: 'We want to buy exactly what we need.' If they ask for A, they're getting A. They're not getting B. If they're asking for a certain thickness, I can order it in that thickness. It arrives at that thickness." With a 98-year history, Brewster (www.brewster-washers.com) also has a warehouse full of metal carefully marked and preserved from previous jobs. That metal comes in handy when a customer orders a washer for next week. The required metal is frequently ready and waiting out back. If Brewster had to rush order material every time it got a rush order, costs would rise.